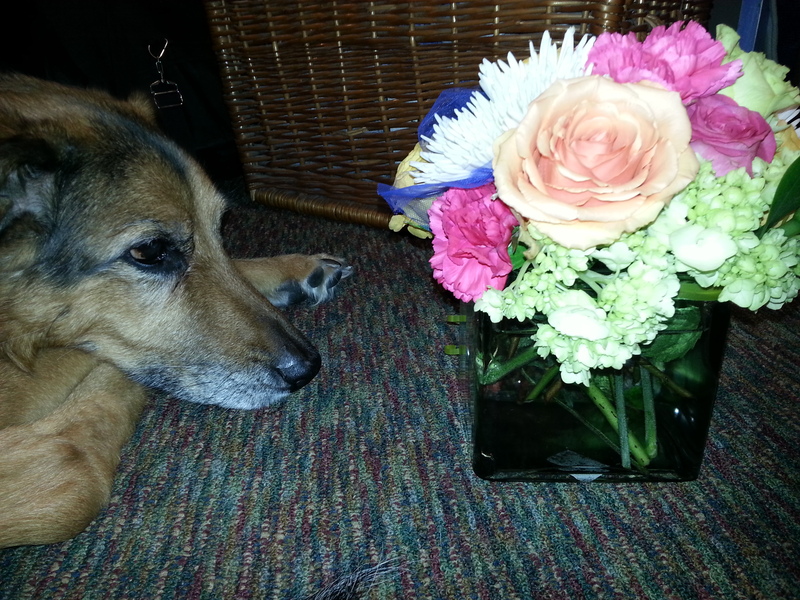 Things are a little hectic here in Flyover Country at the moment, so I am going to post a photo of my dog inspecting the bouquet of birthday flowers my sister and her family sent Mom, who turned 87 this week. My dog, on Mom’s floor, contemplates the the birthday flowers my sister and her family sent from Canada after a dinner of chicken and rice. Mom is not the only senior citizen in our family. Tuki, the aforementioned dog, turned 14 this past September. I’ll tell her full story when things are a little calmer, but here’s a bit about the dogs of my childhood and how Tuki and I came to be a pair. When we were kids, my sister and I dearly wanted fuzzy pets. But Debby was allergic to cats, Dad was not an animal lover and Mom had gotten her fill of animals growing up on a farm. By the time we came along, the only animals left there were Duke and Penny, a pair of dogs. We liked Penny, but Duke, a German Shepherd, was a tad scary. Later, Aunt Bessie and Uncle Sam, who lived nearby, acquired Prince, the ultimate in canine home security. Prince didn’t care who the humans welcomed. Everyone was the enemy. One night, Aunt Bessie, dressed in her nightie, bent down to feed him. Guess where he bit her? It’s mildly ironic then, that Tuki, who started her life with me as a fuzzy round fur ball, grew up to be a Shepherd mix. She has long legs and a long, slender frame. I always tell people that if I looked like my dog, I’d be Naomi Campbell. She was a stray when I found her. She was three months old, gamboling in the side yard at my friend Ann’s office with Ann’s dog Lucas. Ann rented offices and my employer at the time was housed there. I was running a night meeting and had to dash out to pick up a kid. “Who’s the other dog?” I asked. The puppy was having a lovely time playing that game where you get just so close and dash off. Ann’s neighbor Rodney walked up behind it while it was distracted by the game we were playing. He scooped it up and put it in my arms. I tossed the puppy in the car and went to pick up the kid from First Husband’s. I’d gotten her the CD alarm clock she’d been asking for forever and was looking forward to her joy at getting it. The puppy (it turned out to be a she) was quiet as long as I had my hand on her head, stroking her as she sat in the passenger seat. I prayed that she wouldn’t pee there. She didn’t. But whenever I took my hand away, she whimpered. So, when I wasn’t shifting gears, I was stroking her head. I got to First Husband’s and can now testify that a CD alarm clock is irrelevant to a kid when you show up with a puppy. I’d already called the Dog Lost and Found, because I wanted to make sure she wasn’t somebody’s beloved lost pet. They picked her up the next morning. We signed a “finder’s form” that would allow us to have first dibs on adoption if no one claimed her. “C’mere, you cute little stinker,” the DL&F guy said, adding there was a good chance she’d be claimed. I picked her up. I looked deep into her eyes and she into mine. Then, I handed her over. As it turned out, she was somebody’s beloved pet. I already loved her. Then, Providence smiled upon us. As Second Ex was deciding whether he wanted to adopt her during her week at the DL&F, our house got broken into, bolstering one of my arguments for why it would be good to have a dog. Her owners had a week to claim her, and the break-in happened in the middle of that week. As soon as the detective left, I called to see if she was still there. She was, and the woman on the other end of the phone told me that if no one had claimed her by now, they probably wouldn’t. Sure enough, she became ours. We named her M’tukah Ruth Gettelman. M’tukah, because it’s Hebrew for sweetheart, Ruth because she was a stray (“Whither thou goest…”) and Gettleman because the Gettelman Mansion is where I found her. We called her Tuki. That is absolutely how I feel about Tuki. There’s only one way I have ever been able to bear the thought of knowing that dogs don’t live as long as we do and I will likely outlive her. It’s knowing that it would be harder for her to live without me than it will be for me to live without her.